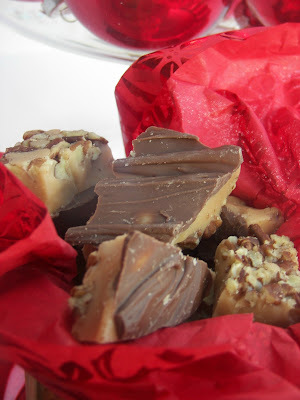 Welcome to Tablescape Thursday, one of my favorite days of the week! We are on the deck again. Can you get too much deckside dining during the summer? I don't think so! I am featuring a set of dishes that I found at a thrift store for ten dollars. They are the Pfaltzgraff pattern of La Rochelle that I believe was discontinuted in 2005. The set came with plates, salad/dessert plates, soup bowls, and mugs. 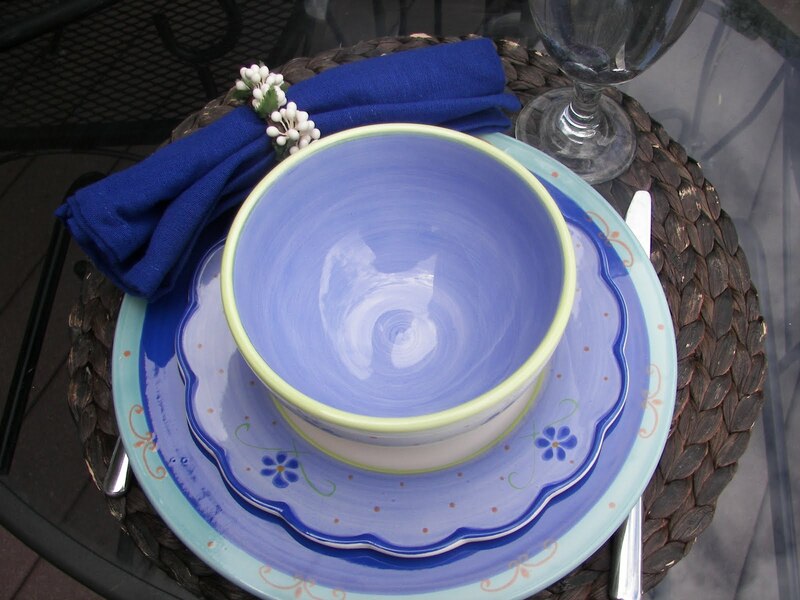 I think the salad plates are very happy and cheery with the blue flowers and I am crazy about the scalloped edges. There is a snappy soup bowl decorated with flowers and cute mugs, which I don't have on the table today. The napkins are paired with the cute Style Sisters napkin rings. Here's a sideview of the bowl; the flowers on the bowl make me happy. I really don't have a lot of blue in my cupboards, but I was able to find these blue glass pieces in my closet and put them in an apothecary jar with a candle. 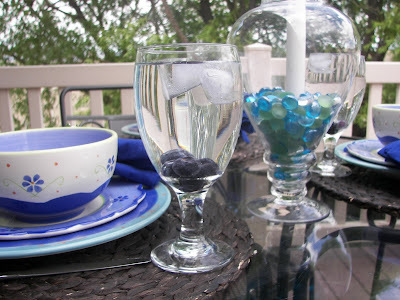 I have put some blueberries in the iced water just for fun! I hope you enjoyed my "Blue Delight" Tablescape. 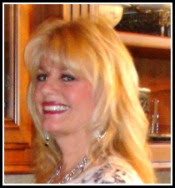 Stop by Susan's Tablescape Thursday where you can view other tablescapes and be inspired to set a better table. Oh such darling dishes. I think blue just looks soo great outdoors. great table. Those dishes ARE adorable! Love the scalloped edge on the salad plate! And those deep blue napkins are perfect with that pattern. Lovely! These newfound dishes of yours are so summery and fun. I love the wavy pattern and the green rims! Your table has a breezy relaxed feel... just perfect for a summer dinner! I love the napkins rolled up casually in those delightful rings! I can just imagine how soothing it would feel to sit and have dinner at this table. And I think you are one creative lady for putting blueberries in the ice water. Such an over-the-top touch! You have a lovely deck to enjoy! Hope to see more deckside tablescapes! Love your outdoor table setting. I wish I was as creative when it comes to the table. Love the blue dishes. 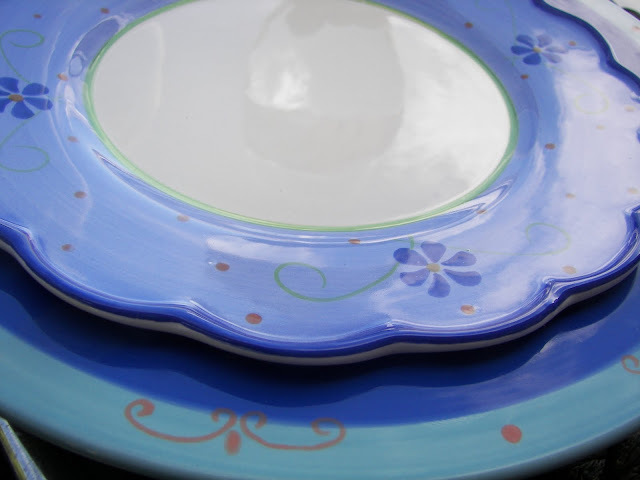 In my opinion, there can never be enough blue plates. Very pretty table, Joni! I love those dishes. Blue is so summery and so classic. 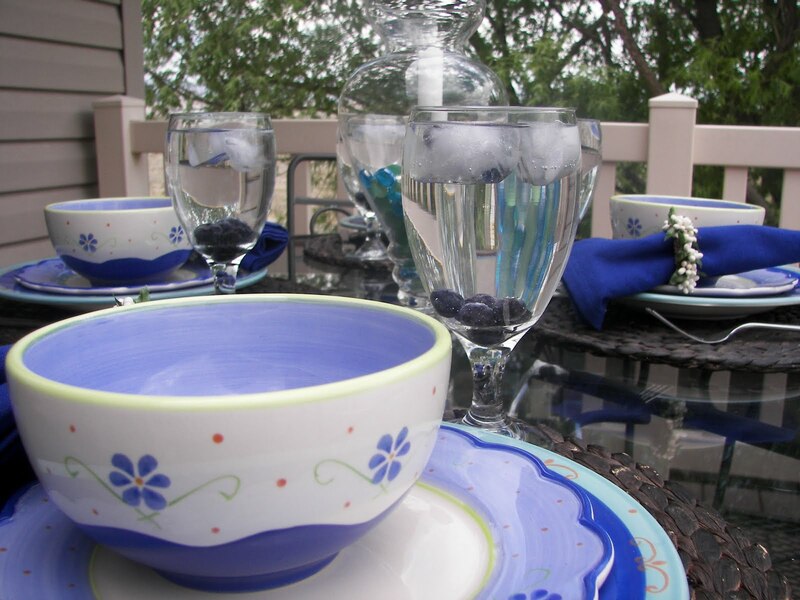 You have a nice place to enjoy eating outside, too! I love your thrift store dishes. SO pretty and summery. Gotta love the thrift stores-I know I do! Nice table! The dishes are really pretty. I love those scalloped edges too. 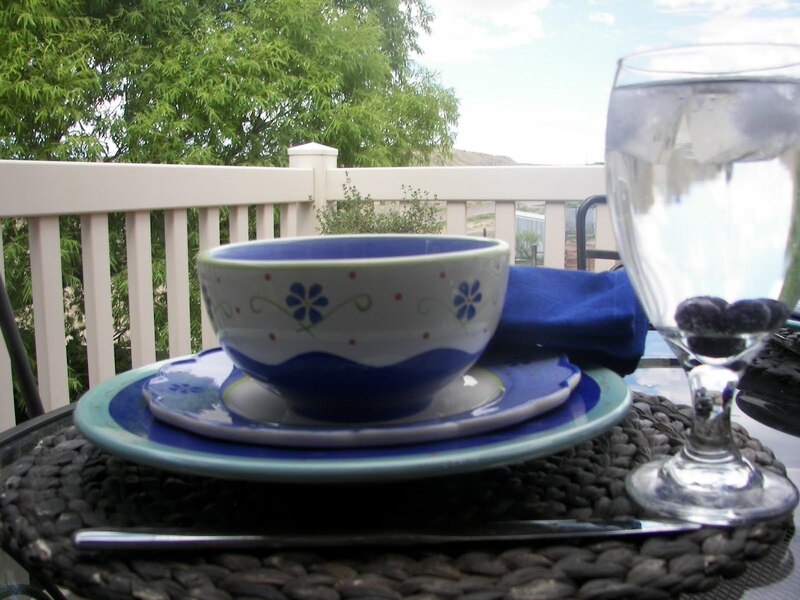 You have such a pretty place to enjoy dining outside! 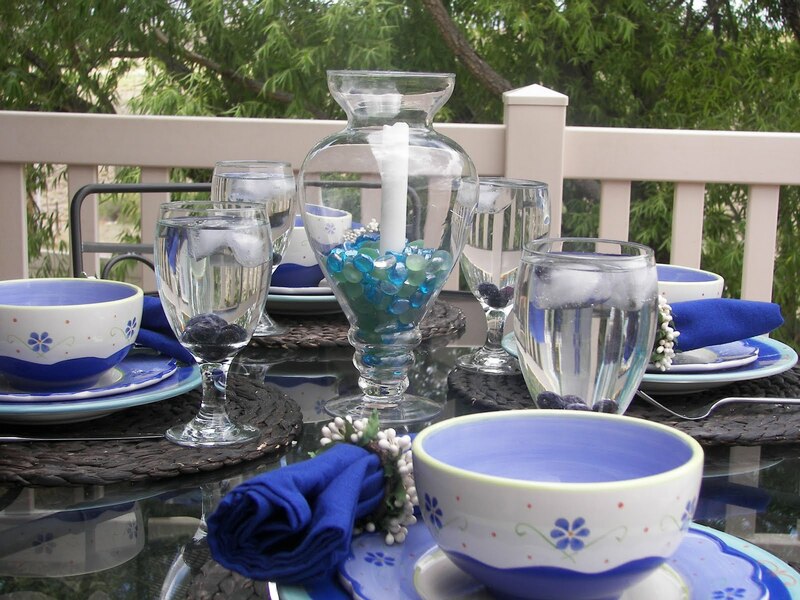 Blue is such a great color for a table, inside or out. Very pretty table, Joni! What a pretty summer table! No, you can't get enough deck life. Cute and refreshing table. I use frozen grapes, etc in my water -- just for the fun of it. That is a terrific buy on those dishes! I love how it looks on the deck. So summery. Great table today!! What a pretty table! Can there ever be too many blue dishes? I think not. Those are really cute dishes! I like the shape of the bowl. I was sent here from another blog for the Strawberry Blueberry Frozen Yogurt, which I will probably be making this weekend. Your picture makes it look yummy! Really cute dishes. Where do you store them all!! The napkin rings really take the setting up a notch, just love them. I had better come over and have lunch on the deck. Your dishes are so pretty. They look perfect for Summer and Spring alike. I just love the combination of various shades of blue. Style Sisters napkin rings look great to! Beautiful tablescape. I love the flower dishware. They certainly look perfect for a summer day. I missed this tablescape because I was out of town (in Salt Lake as a matter of fact) I love how the napkin rings look against the dark blue napkins paired with the pretty blue and white plates! So fresh and pretty. I also love the idea of your centerpiece! the glass stones in an apothecary jar with a candle...so perfect! I may steal that idea. You always come up with fabulous tablescapes!